In the past few years there has been an increase in “Grow House” cases in Florida. These cases involve individuals or groups cultivating marijuana in private homes. They use sophisticated lighting systems and state of the art methods. To combat this crime the Florida legislature has increased the penalties. Grow house operators now face at least 24 months in jail. That penalty increased depending on the weight of the marijuana. Additional charges in these cases often include theft of electricity, possession with intent to sell or trafficking. 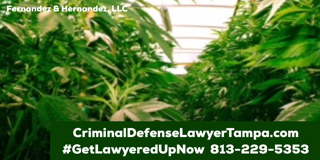 Contact a Tampa Criminal Defense Lawyer at Fernandez & Hernandez, LLC if you have been arrested or are under investigation for being the owner or resident of a marijuana grow house. We are experienced and aggressive Criminal Defense Lawyers represent clients on these felony charges thoughout the greater Tampa Bay area including Hillsborough County, Polk County, Pasco County, and Hernando County, FL. Under the recently passes “Marijuana Grow House Eradication Act” (HB 173 / SB 390), now Florida Statute Section 893.1351, a “grow house” can include any place where more than 25 plants are being cultivated because the statute provides that “[f]or the purposes of this section, proof of the possession of 25 or more cannabis plants constitutes prima facie evidence that the cannabis is intended for sale or distribution.” The trafficking in marijuanastatute still requires a showing of 300 or more plants. The rebuttable presumption that applies to marijuana grow houses might be overcome with evidence that the cannabis was not intended for sale or distribution. That presumption can be overcome if it can shown that the marijuana was intended for personal consumption and/or “medical” marijuana purposes. This charge can apply to a landlord if the landlord knows about the grow house, and the landlord owns, rents or leases the grow house. For the manufacture of a controlled substance intended for sale or distribution to another. This charge applies to owner residents, renters or even visitors if the resident lives in the grow house, is found in the grow house, or exercises control over the grow house, and the marijuana is being grown with the intention to sale or distribute to another (which is presumed if 25 plants or more are in the house). This charge applies to owner residents, renters, or even visitors that live in the grow house, are found to be present in the grow house, or exercise control over the grow house, and the cannabis is being grown with the intention to sale or distribute to another (which is presumed if 25 plants or more are in the house) and the resident knows or should have known that a minor lives in the house or is even present in the house. Who knew or should have known that a minor is present or resides in the place. PreviousPrevious post:Criminal Appeal or Ineffective Assistance of CounselNextNext post:Why Should I Contact a Federal Criminal Defense Lawyer?